Officers with the Beckley (WV) Police Department reportedly raised more than $6,000 for West Virginia Kids Cancer Crusaders, during a 'No Shave November' fundraiser. Image courtesy of Beckley PD / Facebook. 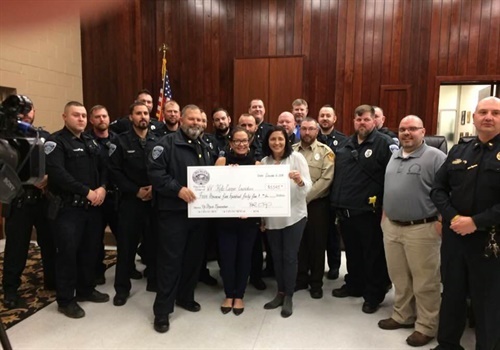 Officers with the Beckley (WV) Police Department reportedly raised more than $6,000 for West Virginia Kids Cancer Crusaders, during a 'No Shave November' fundraiser. Chief Deputy Jake Corey told WVNS-TV that it was a "fun experience." "I am hating that I am going to have to shave it actually, but it is been a lot of fun. I have shaved every work day for 21 years, so to have this opportunity not to shave it's been awesome," Corey told the news channel. The department said on Facebook, "Our fundraiser has come to a conclusion for the WV Kids Cancer Crusaders. With gracious support from the community, we were able to raise over $6,100 which included $580 in officer contributions."